The Tampa Bay Lightning announced earlier today that they have re-signed defenseman Braydon Coburn to a three-year contract extension worth an average of $3.7MM per year. Coburn, who turns 31 tomorrow, has played in 64 regular season games and 26 playoff games for Tampa since being acquired prior to last year's trade deadline. My reaction to this announcement is admittedly not a positive one. Don't get me wrong: Coburn hasn't been a brutal player for the Lightning like, say, Eric Brewer was during the latter days of his tenure. Perhaps the highlight of his Lightning career to date was when he scored the game-winner in the team's pivotal Game Seven matchup with the Detroit Red Wings, which then helped to propel the team forward to the Stanley Cup Final. I liked that moment just as much as any Lightning fan, but this decision to extend him for another three seasons? It has me incredibly confused. The bottom line: He's here to stay, as least for the foreseeable future. And the issue with that is that this team was already going to find itself in a bit of a cap crunch WITHOUT this extension factored into the equation. The Twittersphere has been working hard on the calculator all year to figure out how the Lightning could afford a Stamkos, a Hedman, a Johnson, a Kucherov, a Palat, and a Drouin (problem solved on that one...) moving forward. It was never going to be easy, especially with unmovable anchor contracts like Matt Carle's and Ryan Callahan's taking up so much space. There was going to be a cap casualty or two even before Coburn signed. Now the situation becomes that much worse. Successful teams in the NHL know that you have to pay a premium for your core pieces. It's why Hedman will likely command, deserve, and receive a contract somewhere in the $8MM range. It's why offensive stars like Steven Stamkos are paid such crazy money. The key beyond that, however, is building a capable supporting cast at discount prices. You can keep a high-priced core together if you're able to build an affordable supporting cast, which means drafting and developing well AND finding undervalued pieces on the free agent and trade markets (analytics can be a huge help there, for what it's worth). Drafting and developing young players is so important because they come on cost-controlled entry-level deals. How many teams have an impact player like Nikita Kucherov carrying cap hit of $711,667? It pays to draft and develop well, because that extra cap space can then be used to build a stronger roster. Finding bargain pieces on the trade or free agent market pays dividends too --- look no further than the Lightning's Jonathan Marchessault as an example of that. Where teams get themselves into trouble is when they start paying non-core pieces a significant chunk of change. Exhibit A: The Boston Bruins after they won the Stanley Cup in 2011. Exhibit B: The Vancouver Canucks after they lost the Stanley Cup in 2011. Any moderately deep farm system has enough talent to replace bottom-six forwards and bottom-three defensemen for affordable prices. Why spend money you don't have to, right? 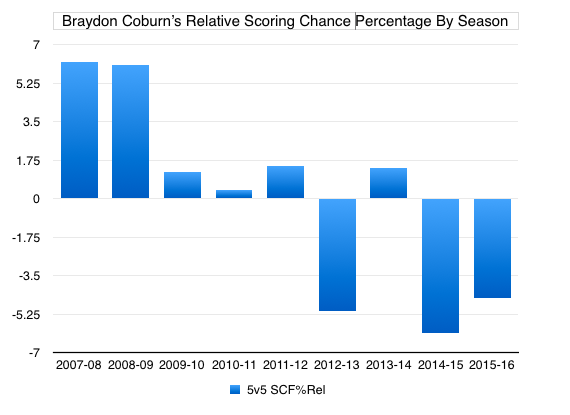 And, let's be honest: At this point in time, that's what Coburn is in the NHL. He's a bottom-three defenseman. Among the 19 players on the Lightning who have played at least 300 minutes of five-on-five action this year, only four have a worse relative Corsi percentage according to War-on-Ice.com. It's true that those four are all defensemen, but I'm not sure "you're not doing great but you're doing better than some guys who are doing really bad" is enough to warrant a hefty contract extension. In a world where the Lightning aren't facing cap doom, maybe it does make sense. Not here, not now. Of course, the next logical question is whether or not the Lightning have someone ready to replace Coburn. Slater Koekkoek springs to mind immediately. The team's 10th overall pick from the 2012 draft has looked incredibly good in an admittedly small amount of NHL action. His possession numbers are strong, he skates like the wind, and he has shown no sign of being incapable of performing at hockey's highest level. I know it goes against Jon Cooper's new coaching philosophy, but maybe it would have made more sense to give the young guy a chance rather than feed a not insignificant chunk of cap space to a replaceable player like Coburn. No, Coburn is not Eric Brewer, but the tale of Brewer is certainly a cautionary one. 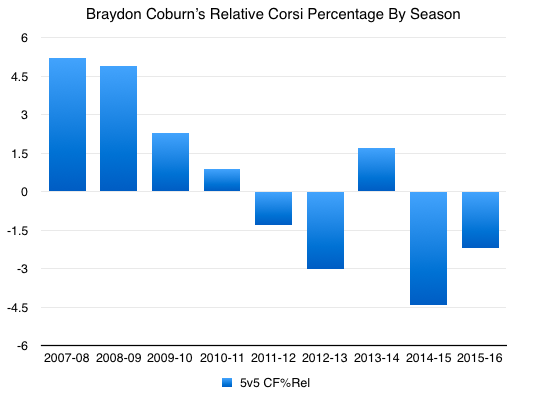 I should note that there *could be* a magic bullet in the chamber that makes this Coburn extension look a lot better than it does right now. Buying out Matt Carle this summer would free up the cap space taken up by this Coburn extension, resulting in an effective net zero position for the Lightning. Net zero isn't as good as things could have been with Carle AND Coburn gone, but it's a whole lot better than Coburn on the books at $3.7MM and Carle on the books at $5.5MM per year. There's been no word from the organization as to whether or not this is an avenue they're likely to explore in the offseason, but it's been bandied about as a suggestion on Twitter all afternoon. Count me in as a supporter. With that said, at this moment, I think the Coburn extension leaves us with more questions than answers. Who's going to be the first cap casualty? What's Yzerman's plan for Koekkoek now? Does this make Jason Garrison the odd man out if he wasn't already? Is there any room left for a Stamkos extension on top of everything else that's coming in a season or two? The list goes on and on. Coburn's new deal does nothing to clarify the cap picture; it only serves to muddy the waters. Here's hoping Steve Yzerman bought himself a quality pair of swim goggles.